Summer Reading Programs in KC! Days are getting longer and the weather is getting warmer, which means one thing: it’s almost summer vacation! While students are rejoicing, it can be a difficult time for parents as they try to prevent the “summer slide”. This refers to the possible learning setbacks that come as a result of time away from the classroom. Luckily, KC has numerous libraries and educational camps that combat the “summer slide”! We’ve put together a list for you of library programs, summer camps, and events to keep your kids reading this summer! Kick-Off Parties: happening at all locations – check out when your branch is having theirs! -A Story Time with Royals Mascot, Slugger! -Story Times for families, babies and toddlers, and Pre-Schoolers. -Practice your reading skills with Reading Education Assistance Dogs. Need more information? View the Mid-Continent Library Website. -Mad Science will present their Build a Better World program. Through the minds and hearts of children, books will be a part of their lives forever. Bookish will open the cover of your child’s imagination by guiding their curiosity with a visit from a real book author, taking a field trip to a real library, writing & illustrating our own books, and delight bringing childhood classics to life with dramatic play. 8 am – 3:30 pm: Academic instruction time. This includes English Language Arts (ELA) in the morning. Lunch is provided, and the afternoon consists of math and other academic enrichment activities. ELA & Math will be our primary focus during these hours. 3:30 – 6pm: Various recreation & enrichment activities are offered during this time until parents pick up their child. An afternoon snack is also provided. May 16th and September 5th, 2017. 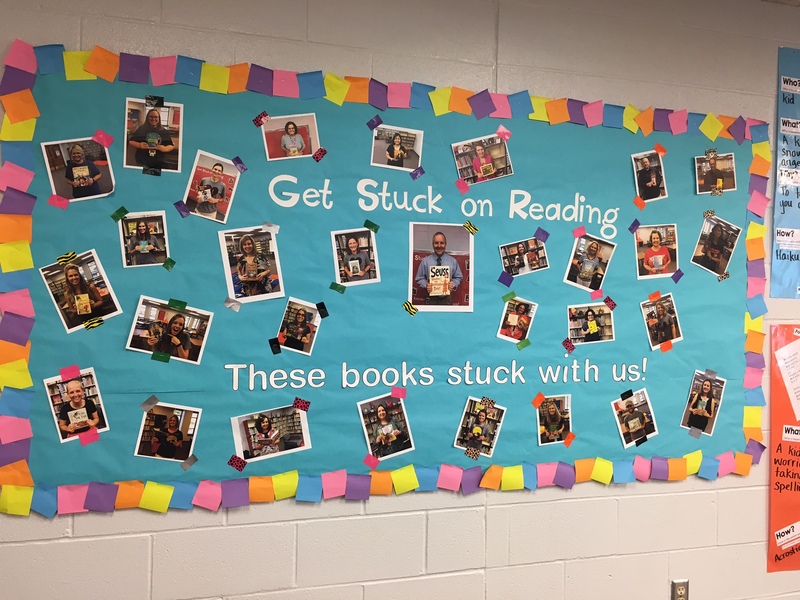 Meadow Lane Elementary & Will Shields Are Stuck On Reading! 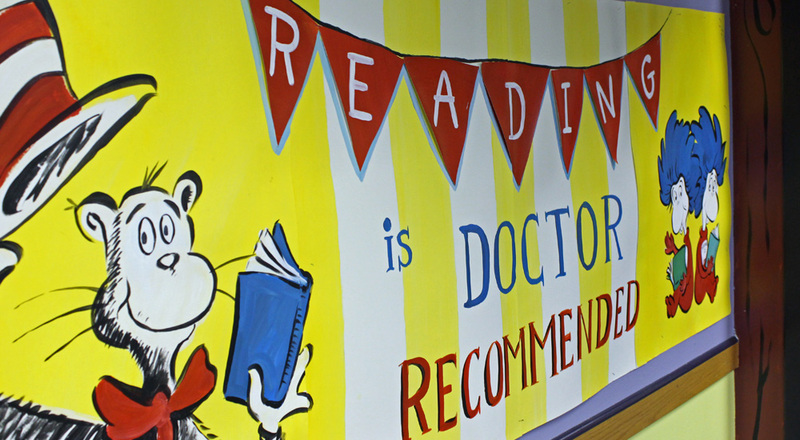 Each school year, Meadow Lane Elementary encourages their students to complete over 200 days of reading. This reading challenge spans the entire year and has a theme. This year’s theme was “Get Stuck on Reading”. 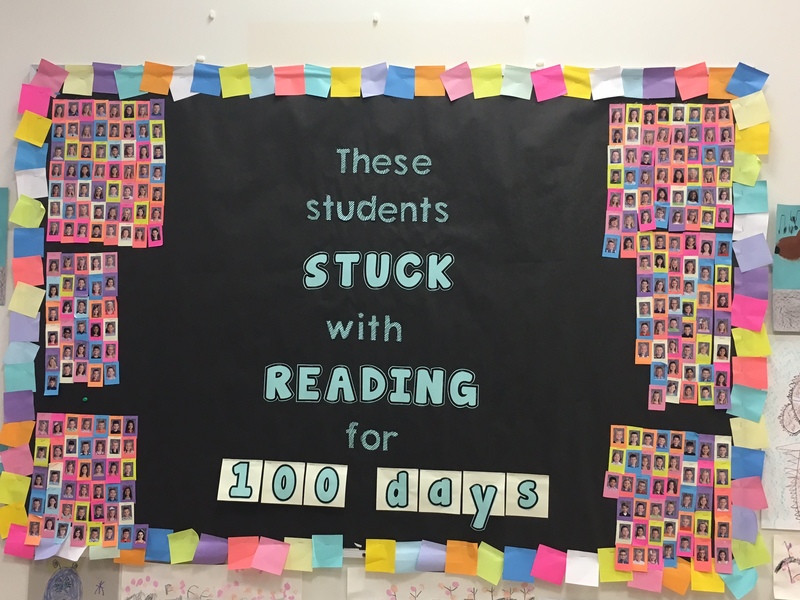 Throughout the year, students track the amount of time spent reading at home. 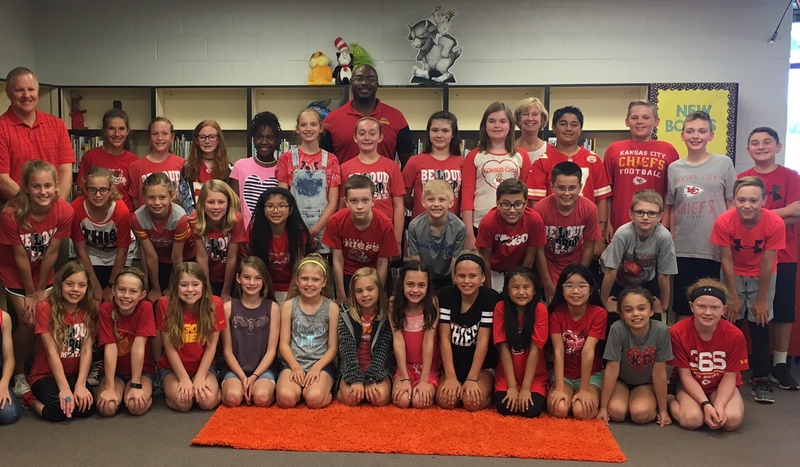 If they reach their goal of reading daily for at least 200 days, then they receive a new book from Will Shields, retired Kansas City Chiefs player. These reading rock stars not only hit their goal this year, but many also donated their new, hard earned books to RORKC. 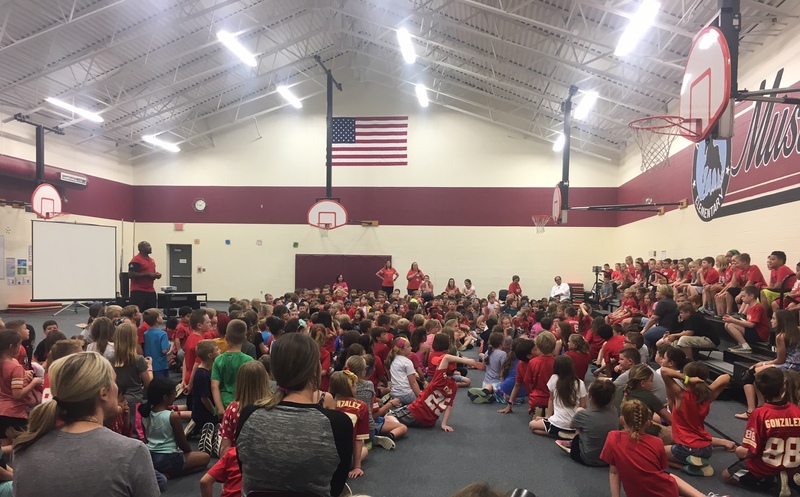 This year, as a school, they donated over 2,000 books and logged over 63,000 days of reading! The fifth graders receive a special reward for reaching their goal: a pizza party at lunch with Will Shields! In the afternoon, the school holds a special assembly, where each fifth grader that reached the goal of 200 days is recognized and receives a signed football from Will Shields. To thank Will, Meadow Lane closes the assembly with a special song about how much fun it is to read! 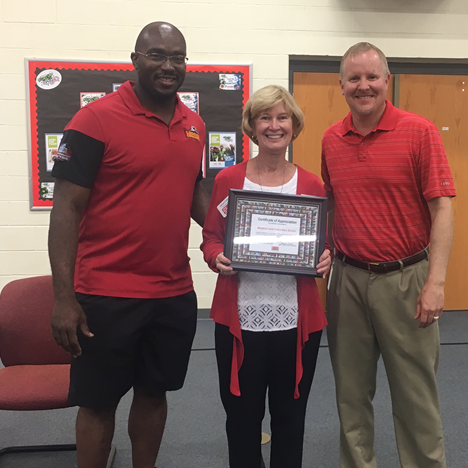 Thank you to Will Shields and Meadow Lane Elementary! On Thursday, April 20th, Reach Out and Read Kansas City will be celebrating our 20th anniversary of providing new and developmentally appropriate books to children at their well-child visits with a Birthday Breakfast. 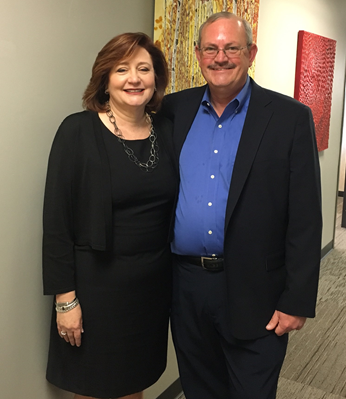 Pamela Miller and Michael Cummings, long-time supporters of RORKC, are our honorary hosts for the breakfast. Recently, we sat down with them to talk about how they became involved with RORKC and why they’ve continued their support over the years. How did you become involved with RORKC? Pamela: I was working for the Kansas University Endowment Association at the Medical Center when a colleague of mine told us that Reach Out and Read KC launched and we should all volunteer to read. Reading is a great passion of mine so I was excited to be a part of it. It was so great because you would read to the children in the clinics as they were waiting for their appointment. You really got familiar with the children books, which was fun because everyone thought I was an expert, but it’s only because I was sitting with the kids and reading aloud to them. Michael: My wife [Pamela] became a volunteer reader at the start of the program and I saw how much joy she took from reading to the children and the passion she had for reading, so I became involved as well. Why did you begin investing in Reach Out & Read Kansas City? Pamela: I love the fact that the mission brings together both pediatric care and encourages families to experience the love of reading. During the appointment, the doctor can observe the child and their development while they are handling the book. Then they talk to parents about the value of reading and what that can mean for their child’s development and education. Michael: Reading is so important. It is a gateway to learning and therefore education. We live in a time where it seems that some leaders don’t think reading is important and some people seem to be averse to learning. In order to have a rich and full life in this technological age we live in and the economy it creates, learning and education are critical to life’s success. Why have you continued your support for RORKC over the years? Pamela: It’s very personal for me because my parents shared their love of reading with me as a child. One of my favorite memories is walking to the North Kansas City library with my mother every week to go get new books. Then at night, my father read the bedtime stories with me. He has this lovely voice and years later when cancer took away his voice through a laryngectomy, I could still hear it in my memories and my dreams. That is what is so wonderful for parents, being able to have this experience with their children. Children will not just remember reading the book with them. It’s far more than reading a book, it’s more than just words on a page. They are going to remember the snuggling time with their parents, their scent, their voices, the time that their parent took to be with them. These memories will always encourage their children to read. I know whenever I would travel for business if I had time to spare I always went to the local library or bookstore and found something new to read. Reading is something that has always stayed with me. Michael: Reading is so important. It’s a passion of mine that started in my childhood. My parents somehow scrapped together the money to buy a set of encyclopedias – which was a kind of internet of the time- and it had a set of children’s books. Those books had stories of faraway places and people that really ignited my imagination on rainy days when I couldn’t get outside to play. Then as a high school freshman, for an assignment, my teacher suggested that I read On the Beach by Nevil Shute. I procrastinated and so I ended up reading the thing all at once. I was caught up in the story and so affected by it. That really fueled my love of stories and reading and that love has continued throughout my entire life. 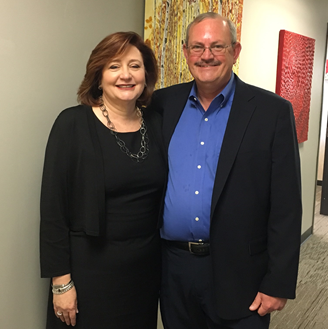 Thank you to Pamela Miller and Michael Cummings for sharing your love of reading and for your dedicated support of Reach Out and Read Kansas City for the past 20 years! Join us on Thursday, April 20th, to enjoy cake, singing, and a special toast to the last 20 years at RORKC’s 20th Birthday Breakfast. Purchase Tickets. Tickets are on sale now for Books On Tap, Reach Out and Read Kansas City’s party with a purpose for young professionals supporting children’s literacy and kindergarten readiness. * live music by Them Pick-less Fools. By attending Books On Tap, you are providing enough funds to purchase 5 books for a child served by our program. Special thanks to our event sponsors, Tingle Flooring and Henderson Engineers, Inc. Follow our event page on Facebook for updates on vendors, entertainment, and sponsors. Once again RIF has partnered with Macy’s to create Be Book Smart, a national partnership to raise awareness and support of children’s literacy. 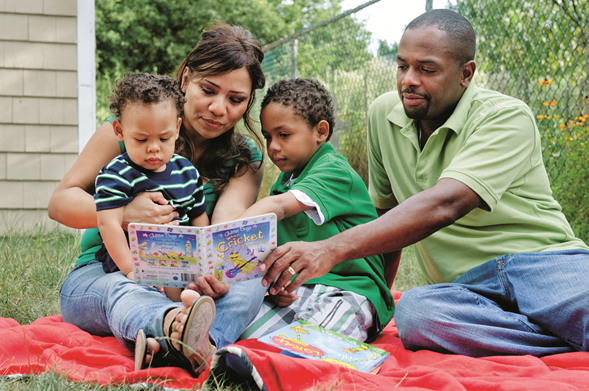 The effort helps RIF provide free books and literacy resources to children nationwide, and Reach Out and Read KC is fortunate to be the program’s local recipient. Between June 21 –July 12, 2015, shoppers at any of the Greater Kansas City area Macy’s can give $3 to provide a book for a child in need and receive a coupon for $10 off a $30 in-store purchase at any Macy’s nationwide. The discount can be applied on purchases made that day or in the future. Macy’s will give 100% of every $3 to RIF. New this year, in addition to the $10 off $30 discount, Macy’s will also offer 20% off a future purchase. This year’s campaign has a special focus on summer reading. 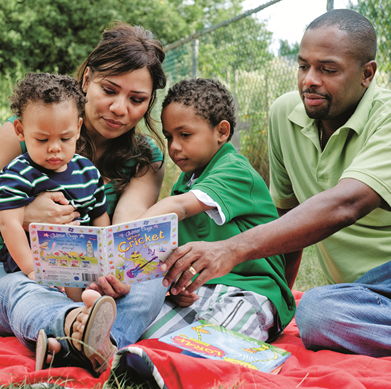 Research shows that reading books during the summer is the most effective way for a child to maintain and even improve their literacy skills. 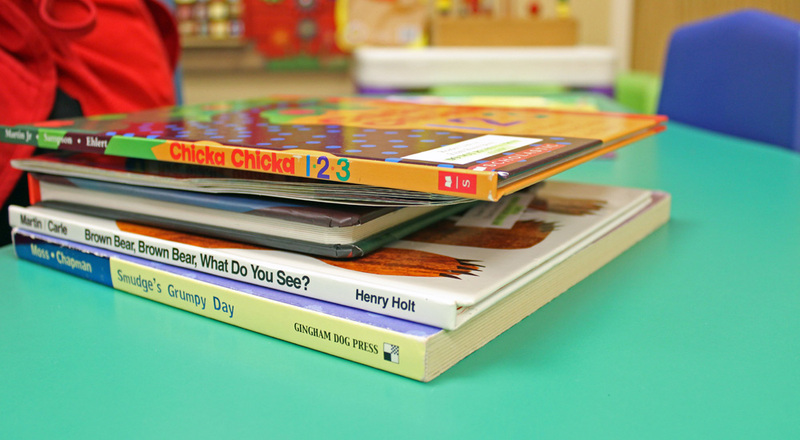 Each coupon sold during the campaign provides a book for a child and just as important, the spark to keep them reading during the school year and all summer long. Meet the inspiring Cheptoo Kositany-Buckner, one of two special guest readers for the 9th Annual Green Eggs & Ham Breakfast, in this video interview as she shares her beliefs on early literacy and the vital importance of reading. Buy tickets now! After months of preparation, Green Eggs and Ham finally took place this past Friday. As a staff-member for Reach Out and Read KC, I was able to experience the event from the very start to the very finish, and what a transformation it was! We turned the Westin Ballroom into a whimsical, rhythmical, magical place, bringing the magic of Dr. Seuss to life. It was my first time at Green Eggs and Ham so even though we arrived at the Westin bright and early at 5am to help set up, I was too excited to even think about being tired. For months I heard stories about the breakfast from years past, and I knew that after all the planning and work we put into this year’s breakfast, it was supposed to be bigger and better than years past. As guests enjoyed a lovely, gourmet version of green eggs and ham, they were entertained by Bryan Busby and Reverend Adam Hamilton who hysterically read the actual book to the audience. I definitely was not expecting those voices out of Bryan Busby! He read the story in an array of hilarious voices from Mickey Mouse, Donald Duck, Chewbacca and Sponge Bob Square Pants. I stood in the back of the room to watch the action take place, and couldn’t contain my laughter, they did a wonderful job making the entire room smile. After the audience was moved to laughter, Superintendent Jim Hinson gave a captivating and eye opening speech about why the kids of Kansas City need our help. After his emotional speech, our Executive Director Megan took the stage and gave a wonderful speech about the importance of children’s literacy. I hope all the guests in attendance were as moved as I was listening to these speeches, they both really hit home and spoke about how every child deserves to reach their full potential. Once the speeches were over, it was time to wrap up the breakfast. I don’t think an hour and a half has ever gone by so fast before. When the last of the guests made their way out of the ballroom, it was time to pack up everything and head back to the office to see the rough estimate of how much money was raised. As it turns out, the 8th Annual Green Eggs and Ham breakfast really was bigger and better than any other year! We raised over $87,000 dollars, which is a huge accomplishment for Reach Out and Read KC. I am extremely happy that not only did I get to experience the best Green Eggs and Ham yet, but that I was able to contribute to the preparation and planning. The Green Eggs and Ham Breakfast will be an experience I will never forget and I am beyond excited that all the money raised will go toward supporting kids in need!